First things first: When did the idea for Mind Games first hit you and what (if anything) did you know right off the bat? I got the idea from reading a really depressing quasi-philosophical book (Straw Dogs) and I felt quite disillusioned by it, and I thought, this would be a book you would give to an enemy. In fact, I don’t know why I’m telling everyone this, but I recommended it to somebody I was angry with, like, ‘Oh, you should read this book!’ Anyway, then I thought, what if people did that for money? Affected others on an emotional or psychological level? I was reading a lot of Laurel K. Hamilton at the time, and it occurred to me there was an urban fantasy in it. You know what’s really funny, though? If you notice, the hit squad is called “the disillusionists” but they don’t actually disillusion people. It’s more like they force breakdown and transformation. In early incarnations what they did was a lot more like disillusionment than it is now. The more UF-ey I made it, the less philosophical it became. Give us an idea of your path to publication? High points? Low? I’ve written all my life—I took writing classes in college, been in writing groups and all that. But I’ve been writing novels really seriously for like 10 years - a couple novels I slaved at, and I had super high hopes for them and they always almost got picked up, etc, but not. Knowing a book you’ve put years into will never be published is distressing. Honestly, my high point is now. I have a first book out there. People have all this goodwill toward it. It is honestly like a dream. I love the whole idea of a hypochondriac heroine and the underground psychological hit squad that recruits her! What made you decide to give Justine such a unique (and painful) handicap? Partly, it’s a case of write what you know, because I used to be a pretty serious hypochondriac. I’m better now. Though, I did give Justine a fear of brain hemorrhages, whereas my area of fear was always cancers in specific organs. I would never have given her that fear, because I would have had to think about it too much. Another thing is that hypochondria is a total liability with zero upside, so the idea of turning it on its head felt exciting and challenging. You know who I love who did that? Jacqueline Carey, with Phedre in Kushiel’s Dart. Who would think a masochistic courtesan who gets off on pain would have spy potential? It’s a fun way of stacking the odds against a character. I also love that your girl has a classic comic book hero/heroine alliterative name—Justine Jones. How did you go about naming your characters? Can you believe Justine was originally named Barbara? But, I have this old writing mentor who was like, character names have to mean something, on a linguistic root level—they can’t just be based on people you have known. And that made sense to me. I chose Justine, because Justine is concerned about being just and fair. Packard was a placeholder name that stuck, but his first name, Sterling, suggests to me a kind of internal purity, but that can be tarnished. As for Jones, it was as you suspect, just chosen for a cool sound. Speaking of, there’s a strong sort of X-Men/Dark Knight comic book vibe running throughout Mind Games. Are you a comic book fan? If so, who are some of your favorite characters? I spent a long time being into Judge Dredd - I loved the irony and humor of it, but I don’t consider myself a real comics connoisseur, like my husband who idolizes all things Jack Kirby and esp. Hulk, so I have spent the last 20 years seeing every comic movie, and we have literally thousands of silver age comic books here in our home. Is there a Mind Games soundtrack? Do you regularly listen to music while writing and/or plotting? I write first drafts by hand, and I hate first drafting, so as a treat, I listen to music, but it has to be melodic—Aimee Mann, Blur, Elliott Smith, Cat Power. And, I have to listen to half of this one Led Zeppelin CD first thing; it’s an OCD thing. If I start with a different CD, things won’t work out. When doing easy editing on the computer, there is more rock and metal involved. Otherwise, it’s silence. There is no Mind Games soundtrack. Do you have a particular time of day and/or place that’s best for writing? Yes! The morning, in a specific chair or at my computer in my home office. Though, I don’t always have mornings free because I’m a freelance writer (ads, magazine articles), and meetings and deadlines can get in the way. But I fight hard to keep my mornings free. Clearly this cannot be the end for Justine. There must be a sequel in the work. Musn’t there? Tell me what we have to look forward to? Oh, yes! 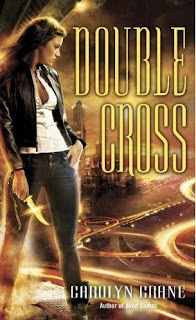 This is a trilogy, and book #2, Double Cross, comes out in September! I recently finished Broken by Megan Hart, and just, wow. I am in awe of her books. That whole vaguely connected group of books she wrote - Dirty, Tempted, etc. I love it! I’m also dying for there to be more of Kelley Armstrong’s Nadia Stafford hitwoman series. Otto: I think of his hat here. A beret. Thank you Angie! This was fun. You ask great questions! And now for the giveaway! Carolyn was so kind as to provide a signed copy of Mind Games to give away to one lucky commenter. All you have to do is tell us what your superhero (or evil mastermind!) name would be. This giveaway is open internationally and will run for one week, closing at midnight on Friday, April 2nd. I'll announce the winner on Saturday. Please be sure to leave me a way to contact you. Oh boy, I have no idea what my superhero name would be, but I'd really love to read this book. We'll go with Pistol Girl. I'd be all awesome with the guns like Agent Zero. I REALLY want to read this book, especially after reading your review ang! Carolyn Crane has got the nicest most down to earth interviews out there and this was another one. Thanks Angie and Carolyn both for the fun and the lovely book to be won by a lucky person. Hope it's me!!! Superhero or Evil Mastermind name would have to be something in keeping with my love of all things Western and in keeping with being born and from Texas I pick "Rodeo Mama', love horses and cowboys! The rockygirl maybe... i would kill everyone with the power of rock!!! jajajajajaja!!!! When I consulted my husband he claimed that I already have an evil super power - baking too many delicious cakes. So I think I might be the Evil Baker. However as most people also think I'm a chatterbox I could be the Toxic Talker! I'm beginning to feel like a stalker with following Carolyn from blog to blog, so I think I'll go for being the creepy stalkerish evil mastermind going by the name of Doctor Swineberg! Hey, these superhero names are a blast! Pistol Girl, Fire, Rodeo Mama, Rocky Girl, Alley Cat, Toxic Talker and Midnight of Magnesia! LOL. That would make some superhero team. And thank you, Angie, for having me for this interview. It was so fun - also, I love what you did with the links and images. Sir Mushroom, defendor of all things Fungi. What? It was my Halloween costume last year. My super villain name would be Procrasto-Woman. I turn your brain to mush, and I make you putt important (and unimportant) things off until the last second. My superhero name: Viridian Mongoose. I don't know, I don't get it either. It's either that or Shantelle Godiva. Oh wait, that's my stripper name. Never mind, this is getting out of control. Great interview. Carolyn's books sound wonderful. My superhero name would be Sapphire Phoenix. For a superhero name,I am thinking of Agent Apocalypse..I could foresee and prevent disasters! Yay! i just ADORE when authors explain the names of their characters. i am freakily obsessed with the backstory and evolution, so thank you Angie for asking that question and CJ for your fun answer! sometimes its so subliminal that i dont make the connection (ex: Justine-Justice) until you say it but realize my subconcious knew the whole time! Awesome interview Carolyn and Angie!! I seriously cannot wait to read this one - I've heard nothing but good stuff. And my superhero name would be the 'Osterizer'. I used to make a lot of smoothies in college so that was what my roomies started calling me -- after the brand-name of the blender I used. It also might have something to do with the mountains of crushed ice it consumed. Plus, it's sorta snappy. I second lustyread- I love knowing the reasons behind the names. As for hero/villian. My son took Taek Wan Do. One of the patterns is called Dan Gun (like goon) another was Jun Gun. Out of that, we made up a western pair, Sheriff Dan Gun (pronound gun) and his gal, June. And once on Cheryl Klein's blog, I won a Worst Sentence Contest with my fantasy villian the evil sorcerer Crabgullion who was defeated by the hero Jorganermander. I loved the interview and would really like to win the book. I'm not too creative, but will go with Manic Panic Girl. The scary part is that I have already thought of my name, heatwave. I figured I would have some kind of control over fire. My superhero name would be Tiah, defender of things that need defending! I enjoyed the interview, and I can't wait to read MIND GAMES! Love the interview, Mind Games sounds like a good read, would love to read it. superhero name...hmmm.,, i think ill just go with bianca riot. not to start a riot, but beat any, so im the hero rather than the villian! I love CJ's blog and I'm so glad that her book is out there and getting so much attention. My superhero name would be Violet Osiris. I think it's wickedly awesome that Carolyn recommended Straw Dogs to someone she was angry with. I love that. LOL! (Please do not enter me in the giveaway). Hmm superhero name? Ermm.. *looks frantically around room for inspiration*...Lady Livrette...making characters from books appear in real life since 1812. Shadow Queen...Erm.. I control shadows (how useful to foil people who try to predict the time using sundials). Ahh what an awesome contest, and what a good book it sounds like, and how unable I am to come up with a good superhero name! Hmm, I recently got a job as a copy-editor, so I think I'd have to be something like the Apostrophe Devil Queen (Phe De Queen for short). All fear the coming of the pedanticism (pedantry?) of Phe De Queen! Otherwise I could just be "The Hated One". I know it's meant to be a superhero name, but I feel my job lends itself more to supervillainy - everyone HATES those people who walk around saying, "You missed out an apostrophe there", and "You mean phased, not fazed", etc. Irritating people! Whoops, apparently Phe De Queen is useless at leaving contact details. Dr. Swineberg I'll join your little stalker club because I also seem to be on a gingerbread crumbs hunt following Carolyn's interviews! 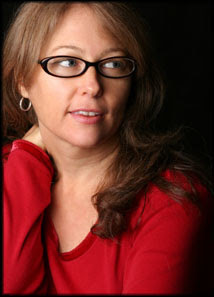 Great interview, I alsways enjoy reading yours Carolyn. I'm realyl glad you went with justine instead of Barbara, sounds better and I love when the meaning/origin of the character's name plays an important part to the character. My evil mastermind name would be Dream Eater. Enough to strike terror into the hearts of ordinary citizens? I think my name would be Dark Jazz. Super-hero...Rock N Roll Redeemer. Thanks for a fun contest. My superhero name would be Fireflash. My outfit would be a red catsuit. I know what I'd want to BE. Someone that can do things with their minds. Or perhaps manipulate elements. oo, so however corny, here's a name. Elementa. I have no idea what it would be... maybe Super Glue?? See, I'm really bad at this LOL. I'm terrible with coming up with names so I'm going to steal the one that my hubby is know as "BIG DADDY"
and we'll leave it up to you to figure out HIS super power. I won a Worst Sentence Contest with my fantasy villian the evil sorcerer Crabgullion who was defeated by the hero Jorganermander.